A Boston Pizza restaurant in northwest Edmonton is partnering with Treasure Life to raise money for cardiac kids. 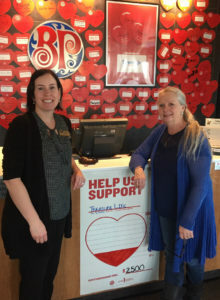 The Albany Market Square Boston Pizza has chosen Treasure Life as the recipient of it’s annual Paper Hearts and Valentine’s Day Fundraiser. This is the first time franchises are selecting a local charity of their choice. Boston Pizza General Manager, Andrea Lawrence, knows the struggles of children living with heart disease. She mentions a friend’s young son, who needed and received a heart transplant. Lawrence then describes making an important connection with Treasure Life at last year’s Golf Classic fundraising event. Lawrence has set a fundraising goal of $2,500. Right now, customers can purchase a paper heart with a minimum two dollar donation. Then on Valentine’s Day, one dollar from each medium and large heart-shaped pizza sold will be donated to Treasure Life. The money supports medical treatment, equipment purchases, and programming for children throughout Alberta and across Canada.